Configuring NIC Teaming on Windows Server 2012 R2 using PowerShell. | Chinny Chukwudozie, Cloud Solutions. ← Arthur C. Clarke Predicts the Internet & PC in 1974 . Just Awesome !! 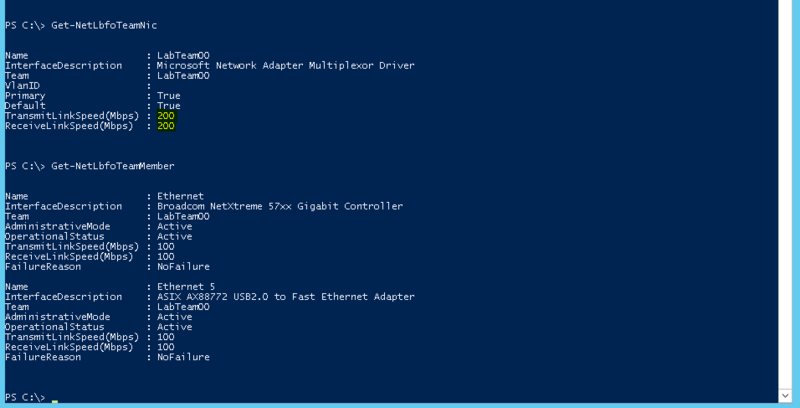 Configuring NIC Teaming on Windows Server 2012 R2 using PowerShell. 1) Teaming Mode: I selected the Switch Independent mode. 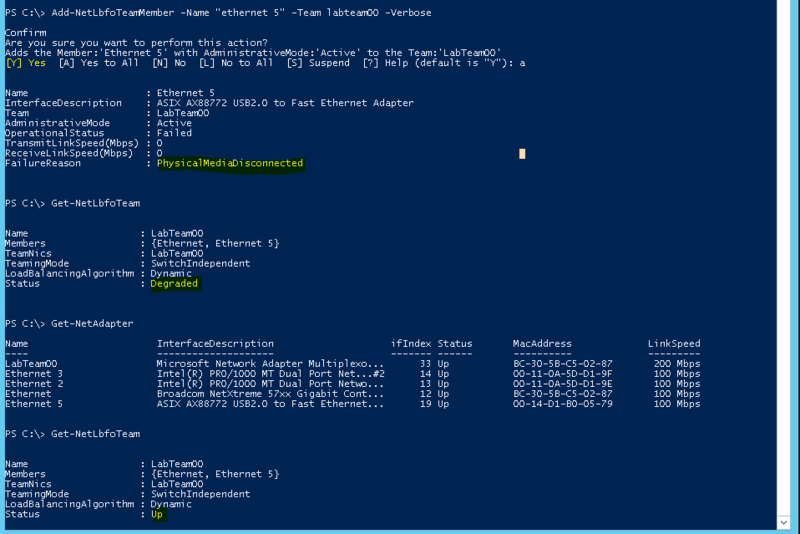 PowerShell Help describes this mode as when a network switch configuration is not needed for the NIC team. Because the network switch is not configured to know about the interface teaming, the team interfaces can be connected to different switches. 2) Load Balancing Algorithm: I selected the Dynamic option. According the PowerShell Help, this option uses the source and destination TCP ports and the IP addresses to create a hash for outbound traffic. Moves outbound streams from team member to team member as needed to balance team member utilization. When you specify this algorithm with the TeamingMode parameter and the SwitchIndependent value, inbound traffic is routed to a particular team member. The screen shot above, shows how the NIC Team status changes from “Physical Media Disconnected” to “Degraded” to Up after a few seconds of adding a second NIC to the NIC Team. Using the Get-NetlbfoTeamNic cmdlet displays the new values for the Recieve and Transmit link speed as an aggregate of both network adapters’ link speed. There’s a few more options, parameter values that could be considered when creating a NIC Team on Windows Server 2012 R2. The PowerShell context Help has a lot of content to enable anyone make an informed decision when designing and configuring NIC Teams for any set of IT infrastructure objectives. This entry was posted in Hyper-v 2012 R2, Network Load Balancing, NIC Teaming, PowerShell 3.0, Powershell 4.0, Windows Server 2012 R2 and tagged LoadBalancing, NIC Team, PowerShell, Powershell 3.0, Teaming Mode. Bookmark the permalink.